I have just listened to the first two of your podcasts and I love them! It's just a few little tips that we all need reminding of sometimes. Have you been looking online for that perfect anchor chart to display to your students and desperately trying to recreate it? Or maybe you don’t even know where to begin with anchor charts! Enter: The Anchor Chart Queen. On today’s episode, we welcome the Amy Groesbeck from The Animated Teacher. Amy shares her tips for how she creates anchor charts, how to involve students in the process, as well as her tips for displaying, organizing and more! Get ready for tons of valuable information that you can take straight to your classroom today! Are you looking for some apps that will make your teaching life and personal life easier? Then look no further because I’ve got an amazing list prepared for you. On today’s episode, I’m going to be breaking down my personal list of favorite apps that I use on a daily basis that make both my teaching life and personal life easier. These five apps will help keep you organized, save you time, and help things in our lives go much easier and run smoothly. I hope after listening today you can take these apps straight to your classroom! And this is only part one of my favorite apps list, so stay tuned for more! Student independence and ownership is a HUGE part of my classroom. I love to let students take the reigns and what better way to have them take ownership in their learning than with a student-led conference?! On today’s episode, we are talking all things student-led conferences. This does not have to be something that takes you a ton of extra time (trust me, it doesn’t at all) and you will be so amazed at the benefits it brings to your conferences! Whether you want to jump into student-led conferences for your upcoming conference season or you are going to file and tuck this away for next year, this episode will give you everything you need to start this in your classroom. I will break down the why behind my shift to student-led conferences and a step-by-step guide on how you can implement this as well! What if you could bring relevant, engaging topics into your classroom AND practice skills rigorously WITHOUT it feeling like work? Ashley from, The Texas Lone Star Teacher, does just that. Ashley is a fifth grade teacher in Texas who has a passion for creating collaborative learning opportunities for her students and within her school. She shares innovative resources, teaching tips, and creative classroom ideas and today she is here to share them with YOU. Grab a notebook, flair pen, and get ready to hear how YOU can bring current events into your classroom today! Classroom management-the number one requested topic for this show and what I get asked about THE MOST. If I could pick one area where I feel the most confident, it would be classroom management. Today, I’m telling you 4 key strategies to take back with you to the classroom that you can use TODAY. Implementing these strategies will not only create structure for your kids, but it will also create a positive and FUN classroom community. Classroom management DOES NOT have to be difficult and YOU 100% can make this an area where you feel confident too! If you’ve been looking for answers to get back control, you’ll find them right here! 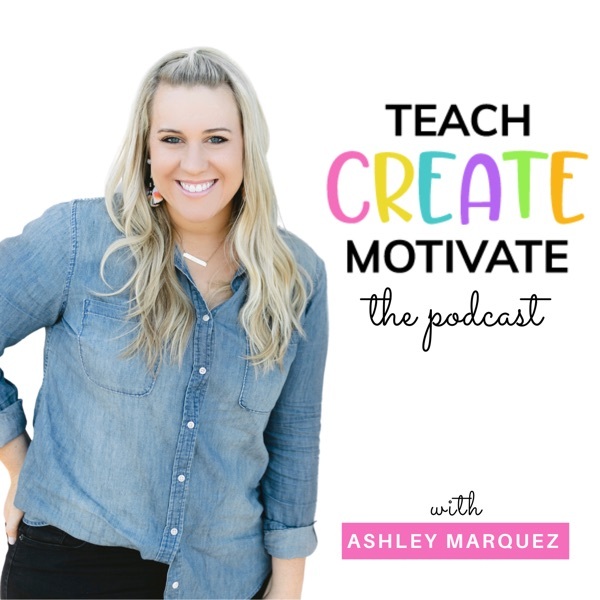 WELCOME to the Teach Create Motivate Podcast! I’m Ashley Marquez, the face behind the teaching website and TPT store Teach Create Motivate. You may also recognize me from Instagram where I share all things teaching, everyday life and Amazon finds! Starting a podcast for teachers like you.. and ME!.. has been a dream of mine for quite a while. Teaching is NOT easy! I firmly believe though that having the right strategies and tips can make ALL the difference. I have so many ideas that are constantly circling through my head and it is a struggle to share them all with you. So, I thought a podcast would be the perfect place to share all things teaching and build a community to collaborate because TOGETHER WE ARE BETTER!! I plan on talking about topics ranging from morning meeting, classroom organization, small group, preventing burnout and so much more! I will also be bringing on exciting guests to share things that they are passionate about and ideas you can also use in your classroom. I’m so excited to see where this podcast goes and I CAN’T WAIT to go on this journey with you!